So, I haven’t written anything here in a couple of years. 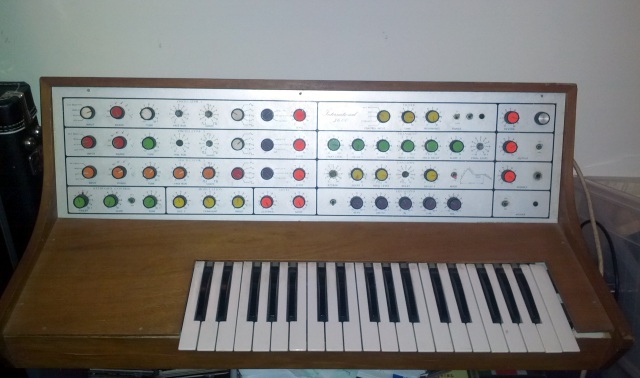 It’s an ETI 3600 – a 3 oscillator kit synth released in Australia in the mid 1970’s. Maplin released a synth based on the same circuits in the UK in the late 1970’s (e.g Maplin 3800 – when they’re working, they sound amazing). This particular one isn’t in working order at the moment – but there’s a ton of resources around (including high-quality schematics), particularly at www.eti4600synthesiser.org.uk, so I’m hopeful I can get this one nursed back to health. It doesn’t really make any proper noise yet. I’ve verified that the power supply works, and the reverb unit and the last stage of the amp works (I can get signal out of it when I thump the reverb tank) but I can’t really narrow down the fault any further without an oscilloscope… which I’m in the process of tracking down. I have a few hunches as to what it might be, though. This one is also kinda weird in that it looks like there’s a bunch of stuff has been added by a previous owner. Also, it needs a scrub. I’m going to try and get some real sound out of it first, and then probably restore it back to stock.